This comprehensive study for a proposed new state highway through Pinal County, from U.S. 60 in the Apache Junction area to Interstate 10 near Eloy, required a Location/Design Concept Report and Environmental Impact Statement to meet NEPA requirements. The sheer size of the 900-square mile study area meant a hugely diverse range of interests and the importance of an inclusive and engaging public process. Our team developed a strategic communication program to provide outreach to federal, state and local elected officials and agency staff, residents, businesses, property owners and other stakeholders within 11 jurisdictions. 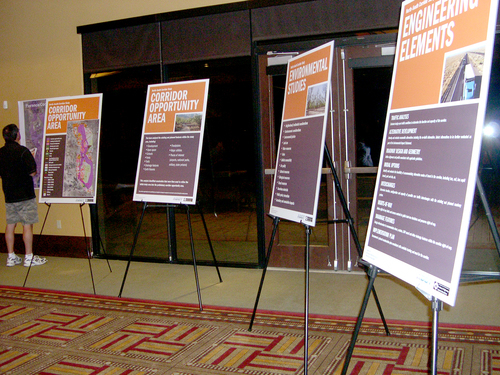 We obtained extensive input regarding potential route locations through multiple rounds of public meetings and workshops, held throughout the study area, in which more than 400 people participated. Our team also distributed an informative newsletter with a postage-paid survey card to over 51,000 people. During the first phase of the study, the critical objective of making highly technical information public-friendly was achieved and more than 700 public comments were received through a variety of methods. While this project involved numerous issues, we successfully helped balance priorities in such a way that the project achieved public buy-in and proceeded into the next phase of the study.